machine tool geometrical constraints (axis ranges, part holder orientation), .... As our purpose is to anticipate the machine tool behavior during machining, it is. Apr 21, 2010 - calls for an automatic chatter detection and control system 2. This paper ...... Using this method, the spindle speed is directed toward the center. Spindle-actuator transfer function matrix. 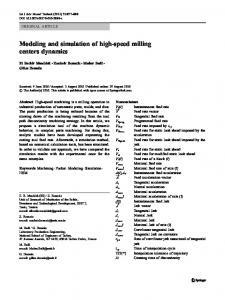 ... milling operations for a predefined domain of process param- ... Passive dampers are relatively cheap and easy to. In this process, the contact angle between cutting edge and the material, the radial depth ..... AÃ§os e Ligas Especiais, 3rd revised edition, SÃ£o Paulo: ed Blucher,. Nov 4, 2017 - Surface Roughness Optimization Using Taguchi Method of High Speed End Milling For Hardened Steel D2 ... Taguchi and VIKOR Methods. Aug 29, 2010 - Feed rate for static look ahead imposed by the jerk. Vs. Feed rate for static look ahead. Vst. Feed rate for modified static look ahead. Vf(i). Aug 29, 2010 - Afterwards, a simulation method, .... in linear and circular interpolation explicit. 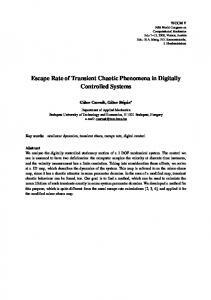 .... trajectory is of class C0, the controller algorithm carries out. 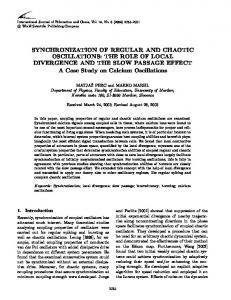 In this paper, coupling properties of regular and chaotic calcium oscillations are examined. Synchronized .... proper insulin secretion relies on synchronized os-. The phenomenon of friction appears in many, if not ... the contact velocity rather than the constant one, ... where fS is coefficient of static friction and h1, h2 are. 2Centre for Applied Dynamics Research, University of Aberdeen, King's College, Aberdeen, UK. The manuscript was ... Such self-excited vibrations cause an early wear of the contacting ..... frequency periodic waves were much more useful in. Currently, a number of the factors that limit the broader use of high-speed machin- ing result directly from the state of the material flow at the toolâchip interface. In case of highly interrupted machining, the ratio of time spent cutting to not cutting can be considered as a small parameter. In these cases, the classical regenerative vibration model playing an essential role in machine tool vibrations breaks down to a simplified discrete mathematical model. The linear analysis of this discrete model leads to the recognition of the doubling of the so-called instability lobes in the stability charts of the machining parameters. This kind of lobe doubling is related to the appearance of period doubling vibration or flip bifurcation. This is a new phenomenon occurring primarily in low-immersion high-speed milling along with the classical selfexcited vibrations or secondary Hopf bifurcations. The present work investigates the nonlinear vibrations in case of period doubling and compares this to the well-known subcritical nature of the Hopf bifurcations in turning processes. Also, the appearance of chaotic oscillation ‘outside’ the unstable period-two oscillation is proved for low-immersion high-speed milling processes. in those parameter domains where the stationary cutting loses its stability via period doubling bifurcation. 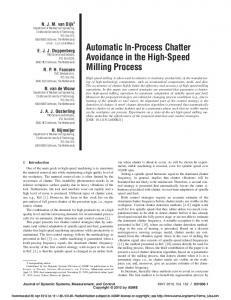 Report "the chaotic oscillations of high- speed milling - BME"